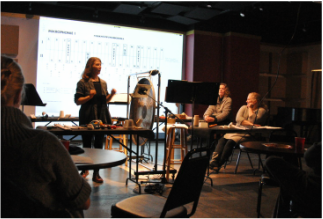 Pamela Z performs solo works for voice & electronics and presents her new work developed during her McKnight composer residency. Ms. Z will give a performance of solo works for voice, live processing, gesture controllers, and projected image. She will feature her new work exploring “Farm to Table”, which will include music composed around sampled voices and sounds from farms, restaurants, and the spaces in between.